We’ve all been watching attentively as Unai Emery has put the players through their paces. He hasn’t had the chance to really work with a full squad seeing as some of those who took part in the World Cup just recently returned, but, it’s been enough to get a feel for what we can expect. Although it may seem fairly straight forward in some positions, the former PSG and Sevilla manager has some tough decisions to make ahead of the first match against Manchester City at the Emirates. At the moment, Arsenal have enough goalkeepers to put together a five-a-side team consisting of just men who try to keep that round object out of the big rectangle behind them. With the signing of Leno, the choice for the starting role is much more up for debate. It’s either going to be the German, or Petr Cech, who looks to have spent some significant time in the gym as of late. They may need to get him a bigger top because the one he was seen wearing in training is a bit too tight and could pose a threat to the blood circulation in his upper body. Safety first! Seriously though, Macey is fifth in the list, Emi Martinez will be fourth, and Oooossssspiinnnnaaa will be third. I’d be very surprised if one, maybe even two of them don’t move on either on a permanent deal, or at least a loan. A loan spell for Macey would be ideal, and Ospina moving on a permanent deal would allow Martinez to stay at the club as third choice. So, who should start on Sunday against City? Realistically, as the season plays out, I think Leno will be Arsenal’s number one. With that said, I’m convinced that Emery is going to go with the safe bet to begin the season. Cech is familiar with the Premier League, and in many ways it makes sense to start him. Unfortunately for him though, he will be watched very closely with Leno waiting to jump at any window of opportunity. If the former Czech international gets too comfortable and has some mistakes as he did last season, Emery will surely be waiting for a reason to get his new signing in the squad. Arsenal didn’t concede many goals in pre-season, but then again, it’s pre-season. This may be the area of the pitch where there are the most uncertainties, something we’ve been used to for years now. With the current selection, I don’t think there is any doubt that Mustafi and Sokratis need to be the starting pairing at the heart of the defense. We could make an argument for the Malaka Party (Sokratis / Mavropanos), or even Chambers to be paired with either. Given the experience of both, I’d be very surprised if they weren’t in the starting XI on Sunday. Out wide is where things get incredibly interesting, frustrating, annoying, and much more. On the left, Ainsley Maitland-Niles is guaranteed a starting role because both Nacho Monreal and Sead Kolasinac are injured. While I think AMN has loads of potential and pace, I’ve said it before and I’ll continue to say it until he proves me wrong – he plays with zero urgency. For a player who is naturally a midfielder, if you watch him closely, when he gets drawn out of a play be that because of poor positioning or the ball gets played around him, he jogs back. It’s almost like he doesn’t care. I watched him closely in pre-season and again, lacking urgency. Let’s see if that carries over into the new season. Over on the other side, Emery is very likely going to start Bellerin, but, I’d go with Lichtsteiner. The Swiss international only featured for an hour or so against Lazio, but that was enough time for him to show what he can bring to the team. Leadership, defensively he’s much better than Bellerin, positionally much better, he’s more aggressive, can play with both feet, and… you ready for this… he can put a ball into the box. It was funny when Bellerin came on and he played in a cross, it went over everyone, which has been typical. Given the style that we play, it’s absolutely fundamental to have outside backs who can put a ball in the box. Without that, we become even more one dimensional because we don’t have natural wingers that get down the line to cross the ball. I’m begging you Emery, start Lichtsteiner in order to show Bellerin that he’s going to have to work for his spot. Life’s not all about fashion photoshoots and ponytails. You’ve also got to be able to put a perfectly weighted ball into the danger area! Two Holding Midfielders Or Two Strikers? Emery likes to play a 4-2-3-1, and it’s very possible he’ll do that on Sunday. If that’s his choice, the two holding midfielders could cause the Spaniard a headache. Does he start Guendouzi, who although is young and prone to a mistake or two, has been superb in pre-season? Or will he go with Xhaka and Torreira? Both just featured on Saturday against Lazio, so fitness could be a concern as well. I guess it will depend on how they progress during the week leading up to Sunday. While I wouldn’t be upset to see Guendouzi in there to start, I also wouldn’t be shocked to see Xhaka alongside Torreira. You may ask, how about Ramsey? Well, he appears to have a knock, and is apparently asking for £300k per week if the rumors are accurate. I say we sell him to Barcelona and work Dembele into the deal. With our current squad, I think we have enough cover in the center of the park, and if needed, we could make another signing in January. With the two holding midfielders, Ozil would operate in the number 10 role. Against Chelsea he operated in a more advanced role which I think suited him well, so it will be something to keep an eye on as the season progresses. Out wide, Mkhitaryan should start on the right, with some question-marks on the left. Should Aubameyang play out wide in order to allow Lacazette to also start? I’m not opposed to it for three reasons. One – I think it’s a complete waste to not have both Auba and Laca on the pitch together. They are both extremely dangerous in front of goal, and will naturally be, or at least should be the leading goal-scorers in the squad. Two – Although Auba plays out wide, we’ve seen that they both interchange very well. Laca has covered out wide for Auba, with the former Dormund striker also capable of exploiting defenders with his pace out wide. Making those runs from the outside in coupled with his blistering pace will give any defensive line nightmares. 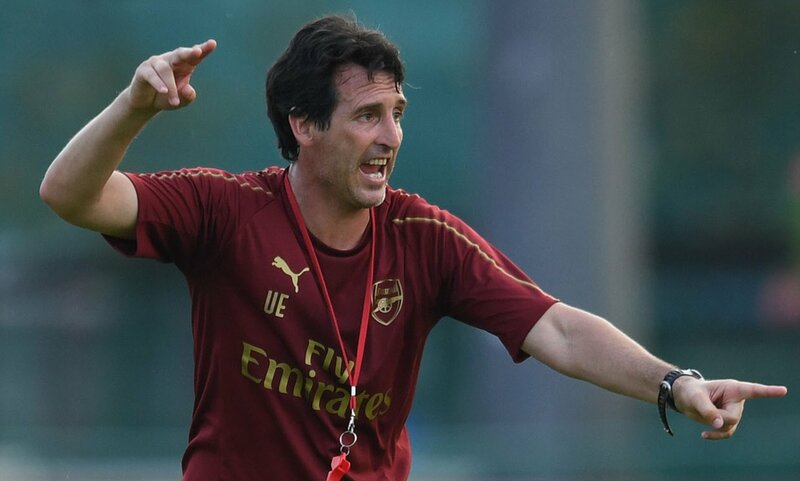 Three – Against Lazio, despite it only being a pre-season match and the full squad not being out there, Arsenal struggled in a 4-4-2, and Emery also stated that after the match. This squad has for years operated in a 4-2-3-1, or something very similar to it, so it may take more than a handful of pre-season matches to really get them to properly understand a 4-4-2. Ideally, I think we’d all love to see Auba and Laca together up top in a 4-4-2, but as I mentioned before, first match of the season, let’s try not to completely reinvent the wheel. This article was originally published here at Wenger’s Coat Zip.